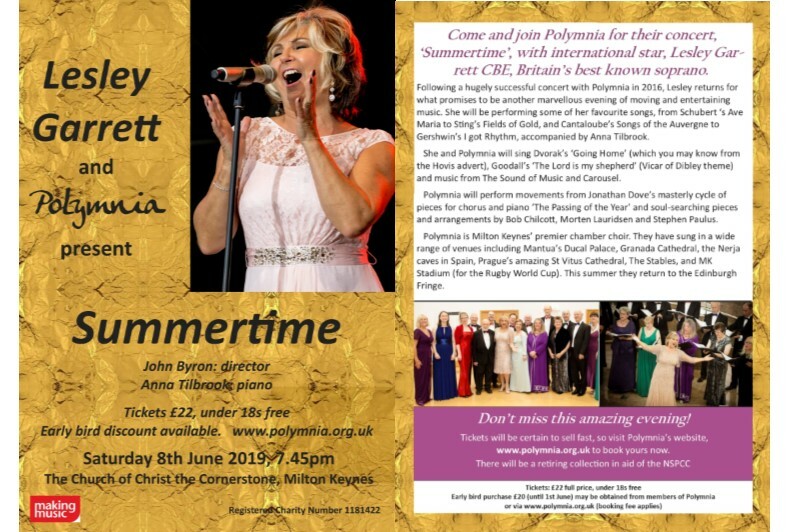 Following a hugely successful concert with Polymnia in 2016, Lesley returns for what promises to be another marvellous evening of moving and entertaining music. She will be performing some of her favourite songs, from Schubert’s Ave Maria to Sting’s Fields of Gold, and from Canteloube’s Songs of the Auvergne to Gershwin’s I got Rhythm, accompanied by Anna Tilbrook. She and Polymnia will sing Dvořák’s ‘Going Home’ (which you may know from the Hovis advert), Goodall’s ‘The Lord is my Shepherd’ (Vicar of Dibley theme) and music from The Sound of Music and Carousel. Polymnia will perform movements from Jonathan Dove’s masterly cycle of pieces for chorus and piano ‘The Passing of the Year’, and soul-searching pieces and arrangements by Bob Chilcott, Morten Lauridsen and Stephen Paulus. 20 May 2018. Milton Keynes Theatre: Opera Gala with MKCO, Damian Iorio, Janice Watson, and Dominic Natoli. 12 November 2011: World Music for World Vision, Church of St Peter and St Paul, Olney (with Daniella Ganeva, Graham Instrall, Andrew Martin and Anna Le Hair). In aid of the World Vision project “Reducing Violence against Children in Armenia”. 18 September 2010: Tickford Bridge Anniversary Concertin Newport Pagnell Parish Church with Sinfonia Ariella and John Gibbons, including the world premiere of a work by John Byron: The Bridge of Destiny.